President-elect Donald Trump and his family sat down with Lesley Stahl for a 60 Minutes interview that aired Sunday night. 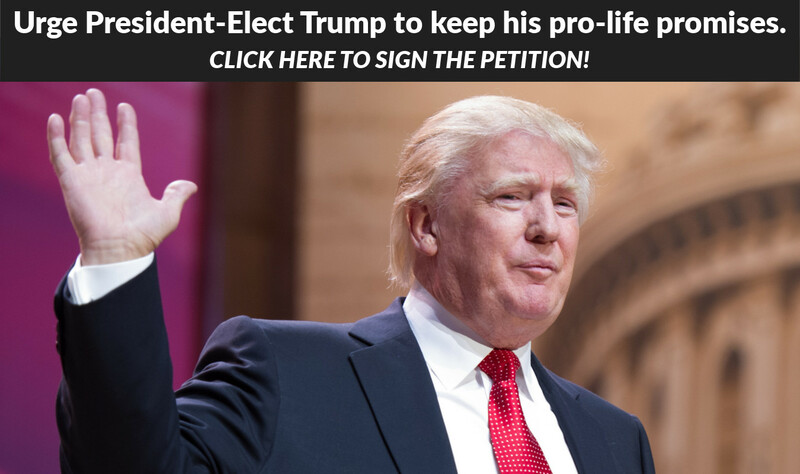 NEW YORK, November 14, 2016 (LifeSiteNews) -- True to his word, President-elect Donald Trump stood by his pro-life campaign stance during his first post-election interview broadcast Sunday night on 60 Minutes. Lesley Stahl challenged Trump on the replacement of Antonin Scalia on the U.S. Supreme Court. Immediately, the president-elect replied, "I'm pro-life. My judges will be pro-life." Pressed on the possibility of overruling Roe v Wade and outlawing abortion, Trump said the issue "will go back to the states." But he assured Stahl that "it will take a long time." "If it were overturned, it'll go back to the states," Trump said. With that, Stahl noted that some states might completely outlaw abortions and Trump simply responded, "Well, they'll perhaps have to go to another state." Asked about LGBTQ issues, Trump defended himself. "I have been in their corner," he said. Regarding homosexual "marriage," Trump flatly stated, "It's settled law," and "I'm fine with that." But the late Justice Scalia, whom Trump has said he admires and wants to replace with like-minded appointees, was not fine with the Obergfell v Hodges decision by the Supreme Court that in a 5-4 vote legalized gay “marriage" in 2015. Trump went on to say the justices he nominates will defend the right to own guns. "They'll be in terms of the whole gun situation … very Second Amendment," he said. Stahl asked the president-elect about his meeting with President Obama — a meeting scheduled for 15 minutes that lasted more than 1 ½ hours. "I found him to be terrific," Trump said. "Very smart. Very nice. ... We had a very good chemistry going. ... It could have gone on four hours." Trump said he and the president talked about peace in the Middle East, North Korea, and ObamaCare. When Stahl continued to try to dig up dirt about rivalries during the nasty campaign, Trump didn't bite. "We never discussed what we said about each other," Trump said, adding that during the meeting he never felt awkward. Trump summarized his future presidency as "It's going to be America first. ... We're losing this country. That's why I won this election — and I won it easily," he said. When Stahl again challenged him about the contentious nature of the presidential campaign, he responded, "Sometimes you need a certain rhetoric to get people motivated." A repeated item during the Trump campaign was the building of a wall to keep out illegal immigrants. Stahl asked Trump is he was going to go through with this promise, and Trump immediately responded, "Yes." Some advisers have called the barrier a "fence" to soften the idea, and Stahl jumped on this, implying a "fence" was different from a "wall." “In certain areas I would (accept a fence)," Trump admitted. But he reiterated that only after the border is “secure,” immigration officials will begin to make a “determination” about the remaining undocumented immigrants in the U.S.
Mexico has said publicly they will not pay for a wall. Trump said he met with Republican leadership and they agreed on moving forward with healthcare, immigration, and a "major tax bill" lowering taxes for Americans, as well as simplifying the tax code. Trump said he wants to "clean up the system" with term limits, and limits on foreign money supporting outside interests and not the average American citizen. Since Tuesday's election, angry Clinton supporters have staged violent riots in cities across the nation. Stahl claimed that Trump supporters were violently counter-protesting. Trump responded by saying that "some of them are professional" paid protesters to further muddy Trump's image. Nine people have been caught fabricating attacks by so-called "Trump supporters." Real Trump supporters, Trump said, are true Americans. "We are going to bring our country back," he said. Despite the widespread violence, neither President Obama nor Hillary Clinton has said anything publicly to stop the destruction. "There is a double standard here," Trump charged, saying that if his supporters had demonstrated violently, it would be much more criticized in the media. Nevertheless, to any of his supporters who might be resorting to violence, he twice said, "Stop it." Stahl confronted Trump about his frequent tweets, to which Trump explained, "It's a great form of communication. I'm not saying I love it, but it does get the word out. When you give me a bad story … I have a method of fighting back." "It helped me win," Trump said of social media, noting he has millions of followers. "Social media has more power than the money they spent," referring to the Clinton campaign. Nevertheless, Trump projected "restraint" in his future use of social media. "I'm going to be very restrained," he said. Stahl brought up Trump's comment during the campaign that Hillary Clinton's abuse of classified emails was criminal and asked if he was going to appoint a special prosecutor to investigate her misdeeds. "I'm going to think about it," Trump said, but first "I want to focus on jobs, on immigration, and get the country straightened over. I don't want to hurt them," he said. Trump said that early on he was going to focus on the economy. "We're going to win on trade," he said. "We're going to destroy ISIS." When Stahl asked for details on how he was going to "destroy ISIS," Trump demurred, saying he wasn't going to publicly reveal to ISIS what he's going to do. Repeatedly during his campaign, Trump said he was going to "repeal and replace" ObamaCare. Stahl brought this up, asking for more details, specifically, "When you replace it, are you going to make sure that people with preconditions are still covered?" Trump replied, "Yes, because it happens to be one of (ObamaCare's) strongest assets." He then added, "Also, with the children living with their parents for an extended period, we're going to very much try and keep that. It adds cost, but it's very much something we're going to try and keep."